Looking for suckers to subscribe to his newsletter or barking for the yak lady? We recently had a client ask us about a radio commercial he heard on the local AM station. The commercial is deliberately vague, saying some guy predicted a bunch of stuff that came true in the past and now he’s predicting something really scary so check out his website. The website launches a video that plays automatically and when you try to leave, you get a pop up that directs you to a transcript of the video. The transcript that I looked at was over 12,000 words long and required over 50 pages to fit in a Microsoft Word document. About one-third of the way through the rambling manifesto, the danger is revealed: this guy’s research shows that while there’s about $11 trillion of economic activity in the US every year, there’s only about $1 trillion actual paper dollars. Our carnival barker insists that this means economic armageddon once people realize what’s going on. He outlines all sorts of doomsday scenarios. I wanted to immediately fact-check his assertions until I saw that he was going to reveal what people should do to survive the impending doom. Ah. Now this is starting to make sense. 50 pages and 12,000 words to get to the truth. This is a pitch to sell subscriptions. The issues our carnival barker raises are easy to debunk as they are mostly nonsensical anyways. The big giveaway here is the infomercial-like hard-sell on the subscription. I’m surprised he didn’t throw in a free ginsu knife. This is really just a dressed up version of the Nigerian prince scam. The traditional Nigerian prince email spam is rife with spelling and grammar errors and is outlandish in general. This actually serves a valuable purpose to the spammer – it weeds out people who have common sense so that the spammer doesn’t waste his time on someone who won’t fall for the scam. Our carnival barker seems to be doing the same thing, but instead of spelling and grammar errors, he misuses the monetary system and banking. This was a fun exercise, but I do take it personally that there is someone out there taking advantage of trusting people. Our carnival barker has a very specific audience and uses touchstones to buy credibility with them such as advertising during certain radio shows. He’s not alone. Companies selling gold at incredible mark-ups and annuity salespeople also find this to be a target-rich environment. The doomsday pornographer makes his living writing fantasy on the internet about economic collapse. He is not in the business of helping people. He is in the business of creating curiosity around his product and a sense of urgency to get people to buy it. 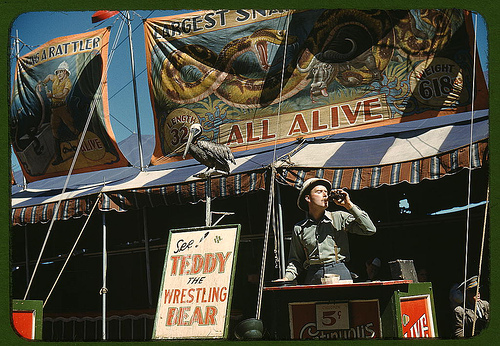 He is a carnival barker.